Tunan is one of the nicer hidden waterfalls in the Manado area, and it’s pretty easy to reach with a short drive and hike. You could get here by scooter from Manado, or another option is to ask your driver to stop here on the way back from Tangkoko to Manado, which is what I did. When I hired a driver to take me back to Manado from Tangkoko National Park, I offered to pay an extra 50,000 IDR ($3.50 USD) to stop here on the way back, and he was happy to oblige. The scenic drive to get to Tunan waterfall is one of the best parts of the adventure. The road winds through some lush green mountains with views of the jungle, palm forests, and Mount Klabat volcano in the distance. It’s a bit of breathtaking, unspoiled nature, and even my driver was gasping in awe. The hike to the waterfall is flat and pretty easy, with a good trail that was added recently. The falls are really nice, and there’s a pool you can swim in at the bottom. I’ve heard the waterfall is 280 feet tall, and I don’t know if that’s accurate, but it’s definitely taller than it looks in photos! There’s a rough path to climb up to the top of the waterfall, but it was getting dark so I was content to just take photos from the bottom this time. I spent about 30 minutes at the falls and didn’t see any other people, not even locals! 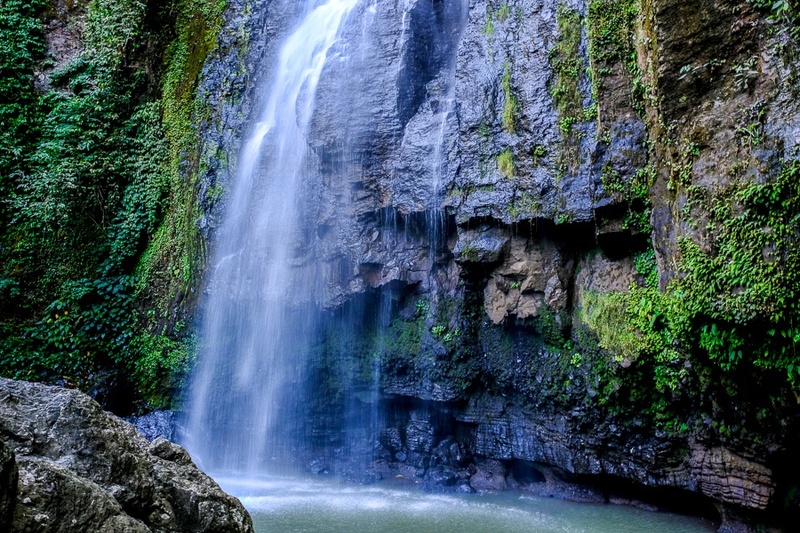 Tunan waterfall is in north Sulawesi, just a 45 minute drive from Manado. The walk to the falls from the parking area is only about 10-15 minutes. As of 2019, the entry fee is only 20,000 IDR ($1.40 USD). There was a booth at the parking lot manned by some little local kids collecting payment for the hike.